The coast of Caracas, Cumana, Parla and the mouths of Rio Orinoco. Partie, Colombie. Amer. Merid. 3. Facsimile: Part of Chart of the Guiana Coast by Jefferys. 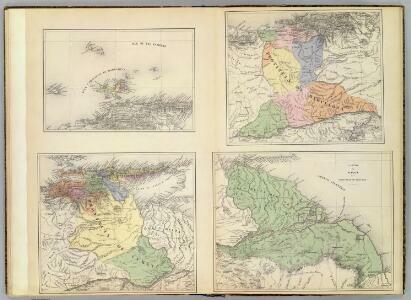 Facsimile: Part of Northern Coast of South America by Jefferys. 1 : 2100000 Lea, I.
Map of the Windward Islands. Boundary-line of Spanish and Dutch Guinana by Heneman. 1 : 1940000 Heneman, J.C. v.
British Possessions on the North East Coast of South America. 1 : 823680 Lucas, Fielding Jr.
Map of Tobago as it was in the year 1756. Rocks and other obstructions off the coast are marked with crosses and the depth of the water in the harbours is shown in fathoms. The names of the larger bays are given in both English and French. Along the upper edge of the map is a coastal view of the north east of the island and along the lower edge is the coast line of the south west. The map carries the annotations, ?On this Rock his Majesty's Ship Chesterfield Struck having XV Fathom the Cast Before. Anno 1749.? and ?The French Fort Burnt in 1749.? 1 : 164736 Lucas, Fielding Jr.
1 : 105600 Lucas, Fielding Jr.
Tobago from actual surveys and observations. Carte de l'Isle de la Grenade. Grenada divided into its parishes. Bequia or Becouya, the northernmost of the Granadilles. A Map of the British Empire in America. (Sheet 20). 226. Venezuela, North. The World Atlas. Mapa de Venezuela ... guerra de independencia.